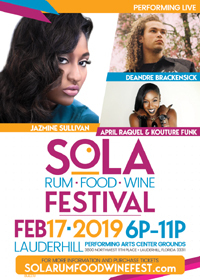 The Lauderhill Regional Chamber of Commerce presents its Fourth Annual SoLa Rum, Food & Wine Festival will take place on Sunday, Feb. 17, 2019 from 6 to 11 p.m. on the grounds of the Lauderhill Performing Arts Center, 3800 N.W. 11 Place, Lauderhill, Fla. 33311. I am super excited to attend as I am a huge fan of rum and soul music. It was announced earlier this week that this year’s entertainment includes Grammy Nominated Artist Jazmine Sullivan. Jazmine Sullivan is a seven-time Grammy nominated artists whose known for some of her greatest hits like Need You Bad, Bust Your Windows and Forever Don’t Last. 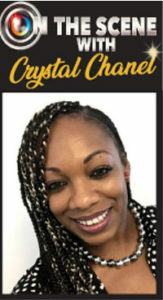 With her heart-tugging lyrics and soulful ballads, Sullivan is more than a R&B/Soul singer, she is a connector and I am thrilled to have her in my hometown, the City of Lauderhill. The SoLa Rum, Food & Wine Festival showcases wineries, rum distilleries and cultural vendors in a beautiful outdoor environment. The festival highlights the soul of South Florida’s entertainment, food, blended cultures, samples of Afro-Caribbean rums and delectable wines. Wine enthusiasts and dining aficionados who are looking for an elevated outing can upgrade to the intimate VIP Experience; complete with a cocktail hour, special gift bags, and chef prepared three-course dinner/wine pairing presentation. All event patrons must be 21 years old and present valid identification upon entry to the festival. “Last year’s festival was like no other and we are looking forward to topping everyone’s experience this year,” said Maria Munro, Managing Director, SoLa Rum, Food & Wine Festival. “Throughout these past three years, events like SoLa have strengthened the central Broward Region’s reputation as a destination for culturally diverse communities, cuisine, entertainment, and arts — a true ‘Floribbean’ lifestyle,” Munro added. General Admissions tickets are $45; VIP Experience tickets for one person is $100 and $180 for two persons. VIP Ticket sales end on Feb. 15. For more information about purchasing tickets, event lineup, vendor & sponsorship participation and more, visit solarumfoodwinefest.com or evenbrite.com.